Our church began its existence in the summer of 1967 as a mission of First Southern Baptist Church in Terre Haute, IN (then known as Temple Baptist Church) at the corner of U.S. Hwy 40 and Thorpe Pl. in West Terre Haute, IN, a location that was formerly Throckmortin's Restaurant. During this same year, the people of Dahlen Avenue Baptist Church were seeking a new place of worship, and after much prayer felt led to join the mission in West Terre Haute. 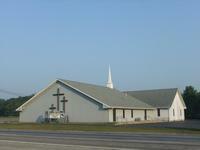 On Sunday June 29, 1968 a dedication was held for the mission and it was officially named the West Vigo Baptist Chapel. In July of 1969, the first pastor was called and it was under his leadership that the mission first constituted into a church on October 3, 1971 and was renamed to Sugar Creek Baptist Church. Since this time, SCBC has been served by 7 pastors, underwent many renovations and expansions, and in October of 2011 celebrated its 40th year of ministry to the community of West Terre Haute and surrounding area. From early in its history, SCBC has been affiliated with the West Central Baptist Association, State Convention of Baptists in Indiana, and the Southern Baptist Convention. Historically, there has been a strong missions focus of the church through faithful participation in the Cooperative Program of the Southern Baptist Convention, individual sponsorship of local, domestic, and international missionaries, and through engaging in mission trips/projects of its own. In addition, in 1993 SCBC sponsored its own mission church, Victory Baptist in Clinton, IN, which is still going strong under the pastoral leadership of one of SCBC's former members. We praise God for His faithfulness to the congregation of Sugar Creek Baptist Church and pray for many more years of fruitful Kingdom work.